The Pleiades, the stunning Seven Sisters, can be found high in the sky as the Sun sets during the end of winter; as springtime progresses, it sinks lower and lower in the west. Face south to find and the cosmic giant, Orion the Hunter, a very large hourglass-shaped constellation. This Star Map can help orient you in locating Orion, his red shoulder star Betelgeuse and both reddish Aldebaran and the Pleiades star cluster, further to the northwest (right). Once you have this orientation, Look Up in the night sky for this diagonal lineup of two red stars and a glistening star cluster. The Seven Sisters form the shape of a tiny dipper in Taurus the Bull, northwest of reddish Aldebaran, the Bull's eye. 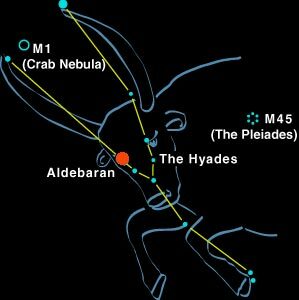 Aldebaran is one end of the V-shaped Hyades star cluster, the Bull's face. The Pleiades mark the hump of the bull or the brand on the shoulder of the Bull. The dipper-shaped Pleiades sparkle bluish-white in the night. The Pleiades are probably the most recognized and celebrated star cluster in the heavens. Even observers in light-polluted cities can view these reputable stars with the unaided eye. Did you know this is one of the brightest and closest open clusters and that it is also known as M45 and Subaru in Japanese? The Pleiades ~ Seven Sisters and Their Parents! Note: The blue haze surrounding the stars is the remaining interstellar dust and gas from which these stars were born. The two stars paired together on the left are the parents of the seven sisters. The seven sisters are on the right. SEDS says the Pleiades are 100 million years old and have an expected future lifetime as a cluster of only another 250 million years; after that time, they will have been spread as individual (or multiple) stars along their orbital path. In addition to the 7 brightest stars this cluster includes over 500 dimmer stars spread over an area four times wider than the Moon. With recent increased technology and new observations APOD estimates that the Pleiades contains over 3000 stars, is about 400 light years away, and 13 light years across. This jewel of a star cluster is a friend to both the night sky traveler and the pilgrim on the spiritual path. It is said that the Pleiades transmit the Light of God, also known as Mahat, Universal Mind, into our minds enabling God's light to descend on Earth. May your night sky journey to the Pleiades expand your horizons and fill you with awe and wonder and the Light of God. Be blessed and spiritually empowered by their radiance through the spring. By the summer they will sink out of view below the western horizon.